Sometimes these CLIs come with a lot of configurations, which may be fun to use, but also a bit complex, since some commands may take in a lot of parameters and flags. 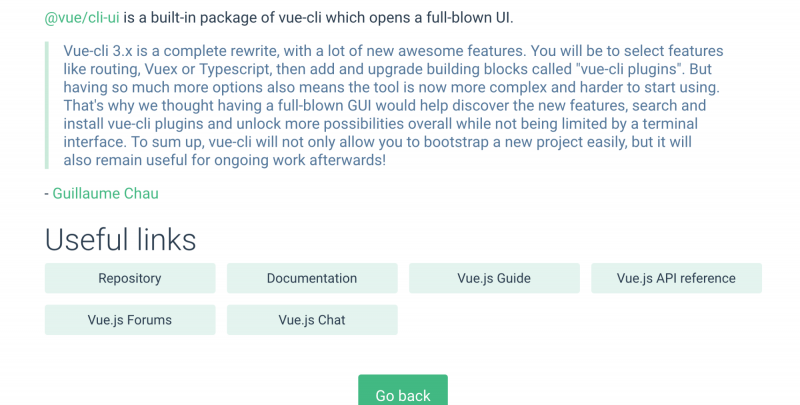 The Vue CLI introduced a Graphical User Interface (GUI), which can save us a lot of time and give us clarity on what we are actually doing while building a Vue App generated with the CLI. NOTE The UI Tool is till in Beta, and a lot may change. You should have NodeJS installed. 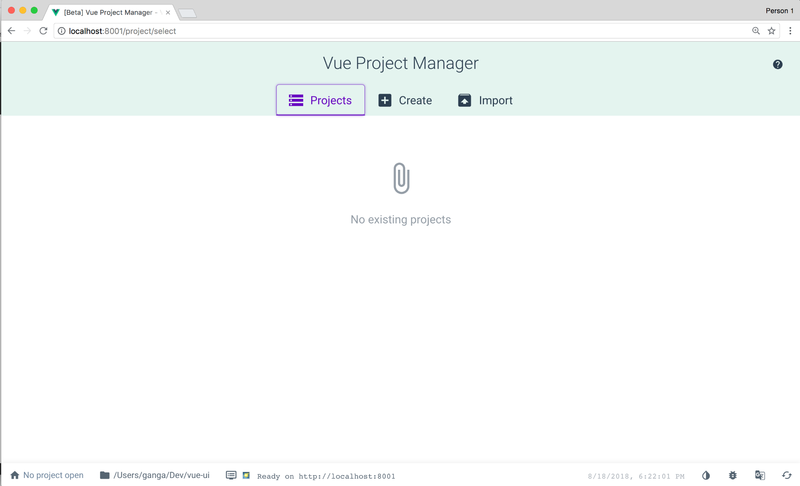 You need to have Vue CLI 3 installed. Typing in vue on your terminal should give you this. Among the options, you can see there’s a command called ui. This is what we’re going to explore. 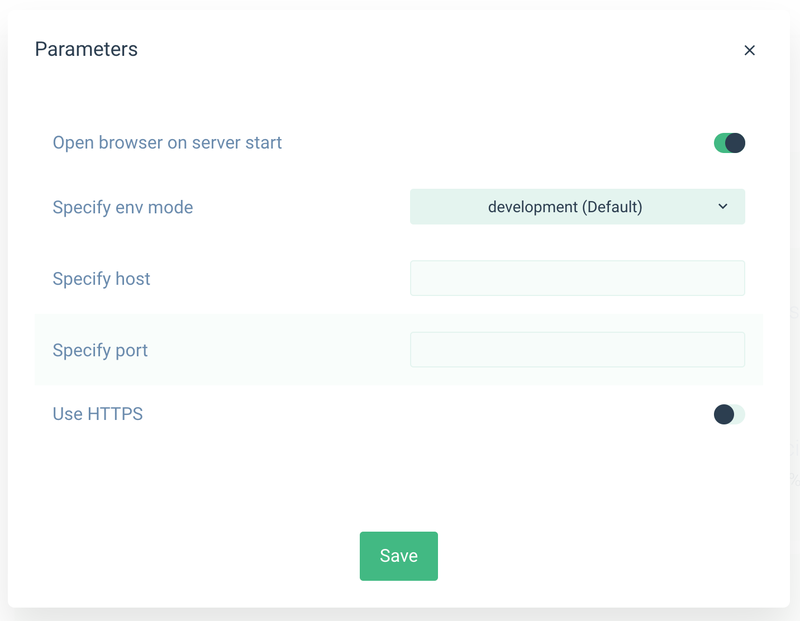 This opens the Vue GUI on http://localhost:8001 on your default browser. 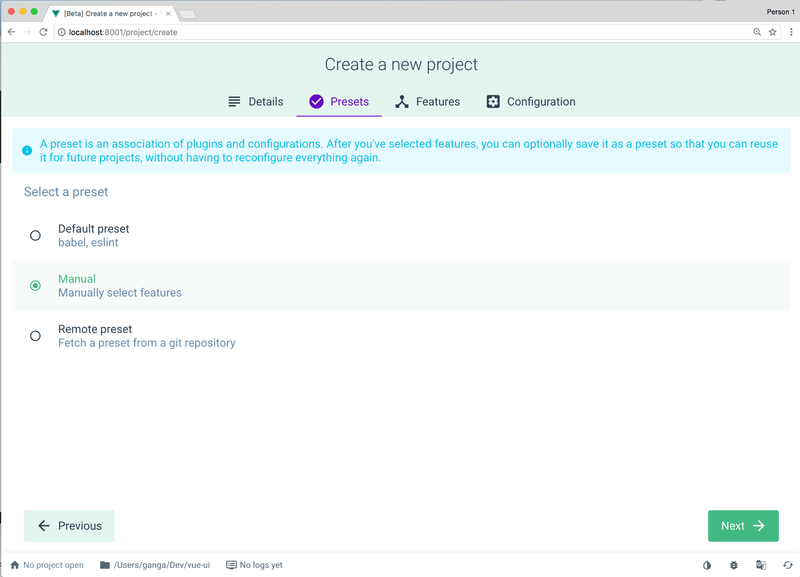 Import – will allow you to import a project from either a directory, or a remote github repository. At the bottom of the screen, on the status bar, you will be shown where your current directory is, and on the far right, you can change the theme of the app. Let’s create a project. Click on the Create Tab, and click on the Create a new project here button. A pop will show up. 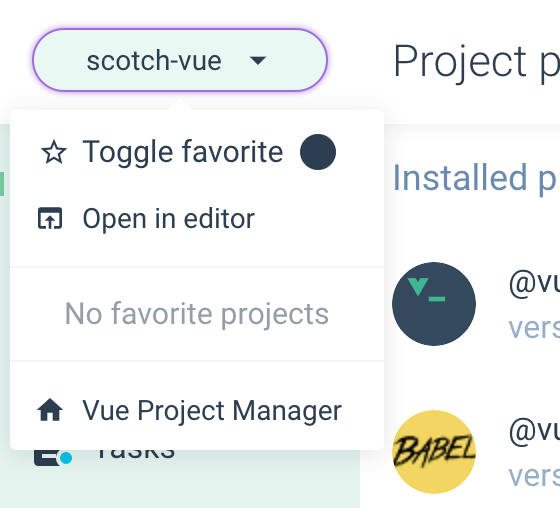 Let’s fill it in with the the project name scotch-vue. 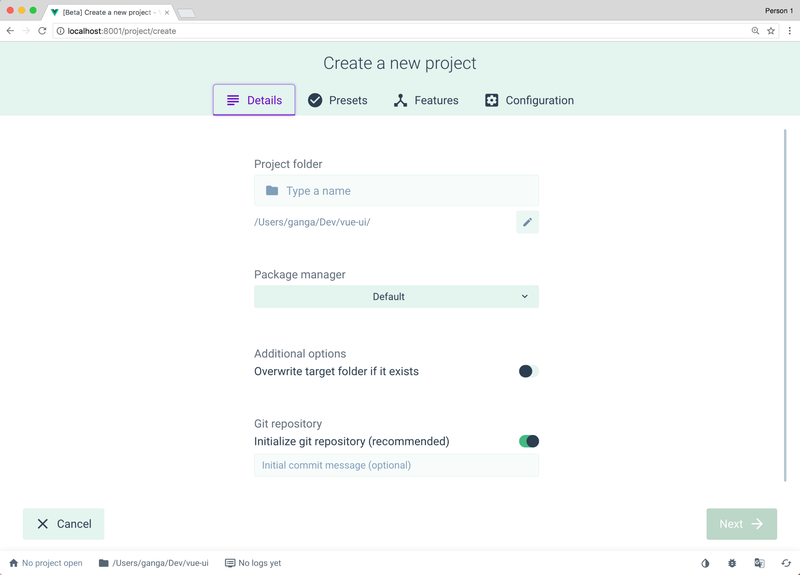 Select npm as the default package manager, and initialize a git repository if you want. Press next, and you’ll be taken to the presets tab. 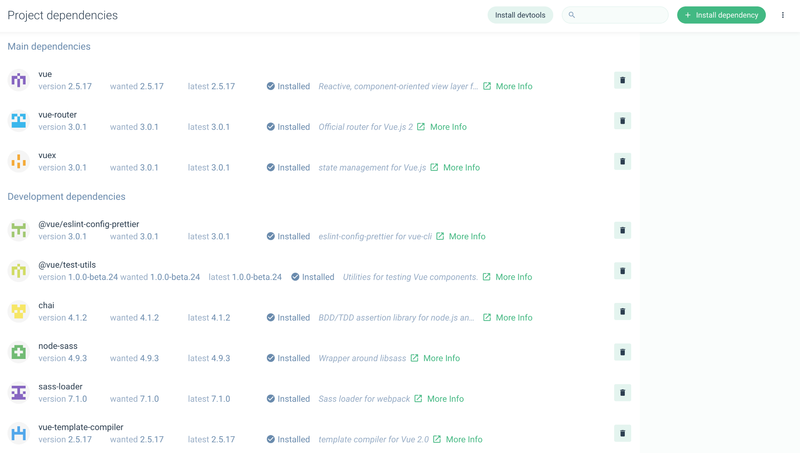 This is where we add in the configurations that are common to Vue applications. Select Manual and press next. 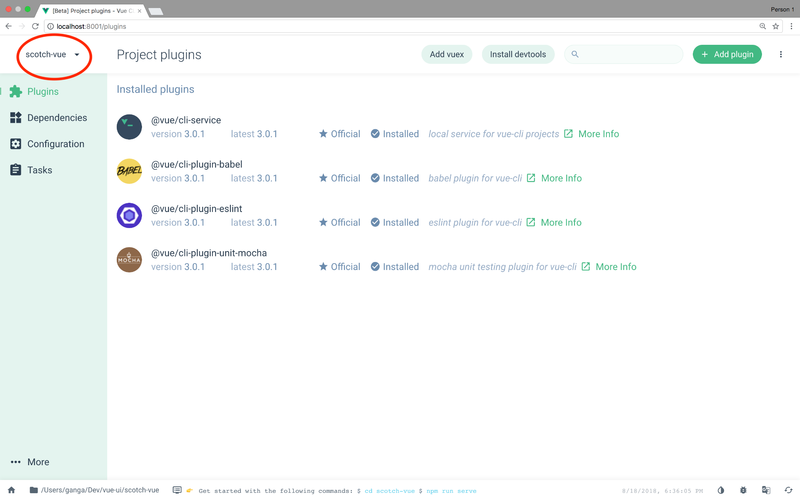 You’ll be navigated to the Features page so that you can select the Plugins and Configurations you want. I went mostly with the following configurations: Babel,Router, CSS Preprocessor, Linter/Formatter, Unit Testing, Use Config Files. Scroll down to see all the configs. 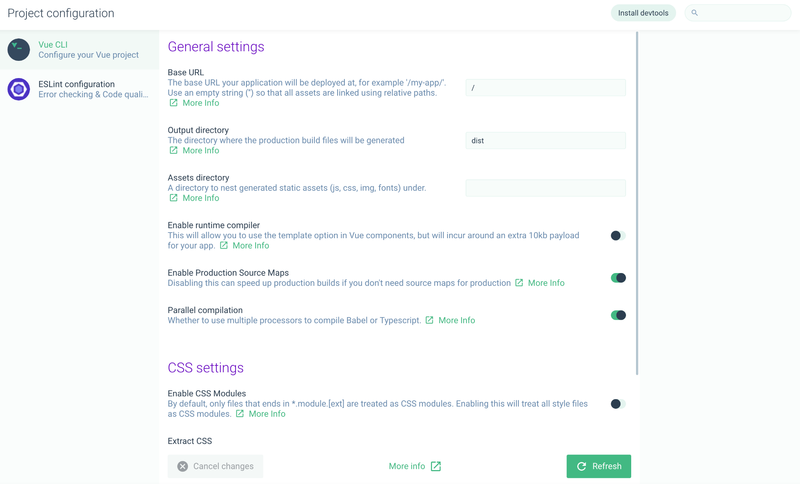 All the options have a More Info link, that opens in a new tab with the documentation on the plugins/features you are adding. Finally, press next and you will be directed to the configurations section. Here’s where you customize the configurations for the features you added in the previous section. I decided to choose ESLint + Prettier, and selected lint on save. Click on create project. You will be asked if you want to give the settings/preset a name. I called it scotch-vue-preset. Next time, you can just scaffold a project directly from this preset. 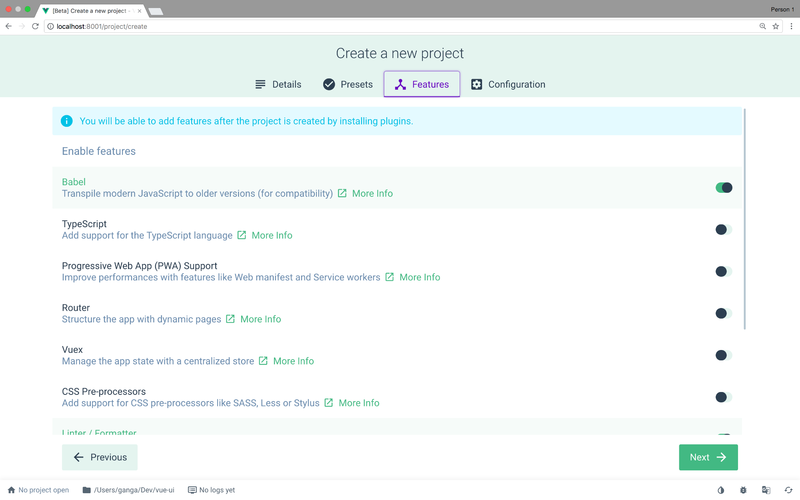 Clicking on Create Project will give you a loader, telling you the progress of the project creation, and the once done, take you to the projects dashboard. You can open the application in an editor, by clicking on the app name on the top left. Lists your plugins and allow you to install other plugins into your current project. You can click on the Install Plugins button on the top right to enable you search and install plugins. 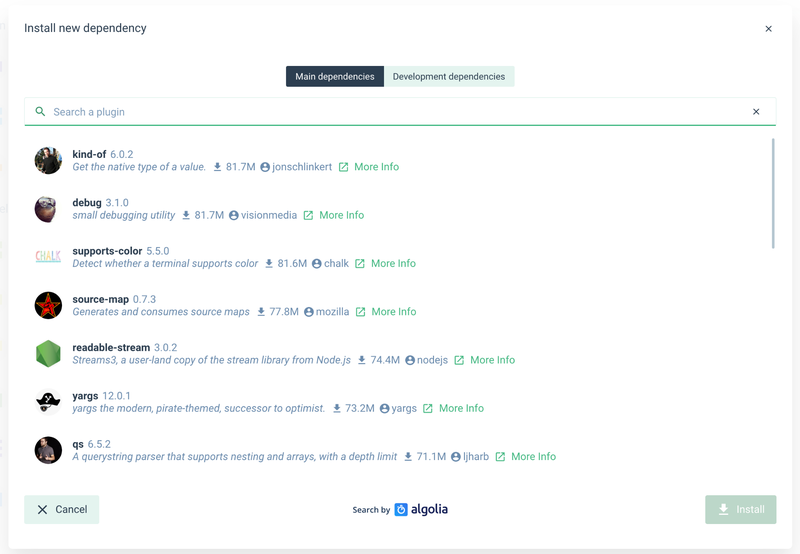 Lists your npm dependencies, and allows you to add/remove dependencies. You can click in the Install Dependencies button on the top right to enable you search and install dependencies. Tasks allow you to perform operations on your application, that you normally do when building apps. They include the following. I’ve taken the descriptions directly from the UI. Inspect – inspect the resolved webpack config. Note – These tasks are listed here based on our configuration. We do not have the E2E task listed for instance. We’ve seen that this section compiles and hot reloads your application. 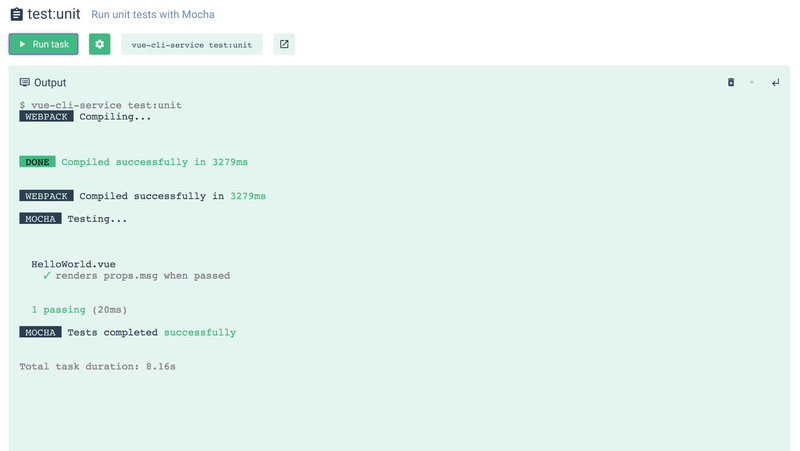 The first part of the Serve section allows you to configure the serve task. You can click on the gear icon to configure the serve task. 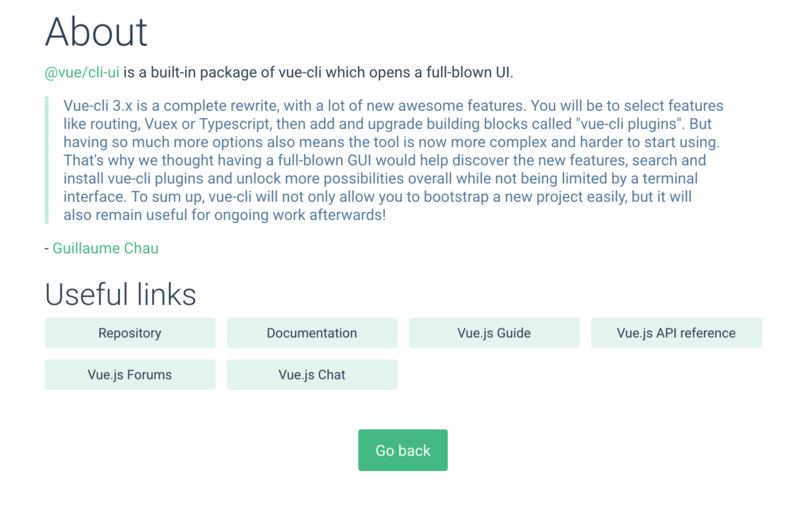 The more info button will open documentation regarding the vue-cli-service. Then clicking the Run Task button will update the Dashboard Tab, and open the app in a new tab, as we specified in the serve task config. 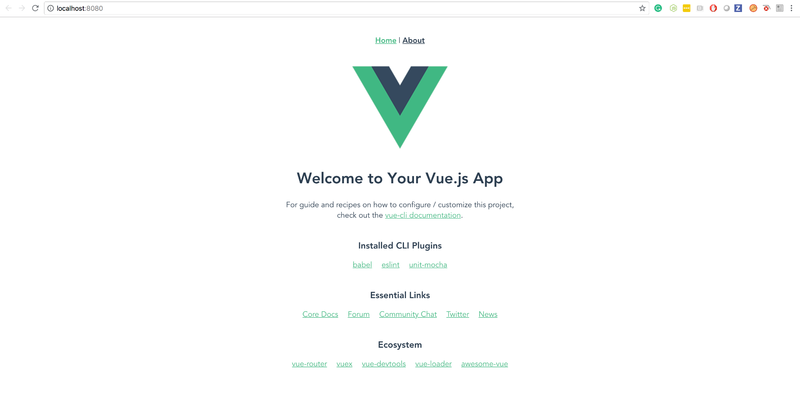 This is the tab opened, the default vue-cli app, with documentation links. The Run Task button changes to Stop Task. 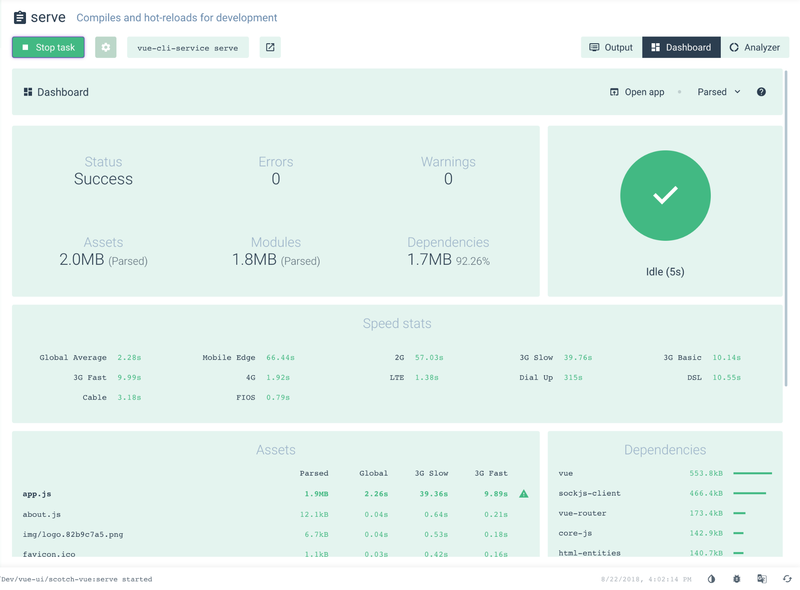 The dashboard tab shows various stats about your application bundle, you can inspect it to see file sizes, and even loading speeds for your files. 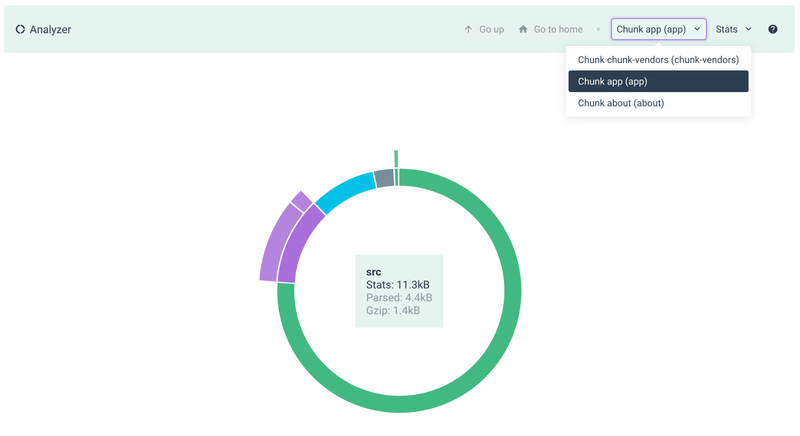 This tab shows the logs for your task process. 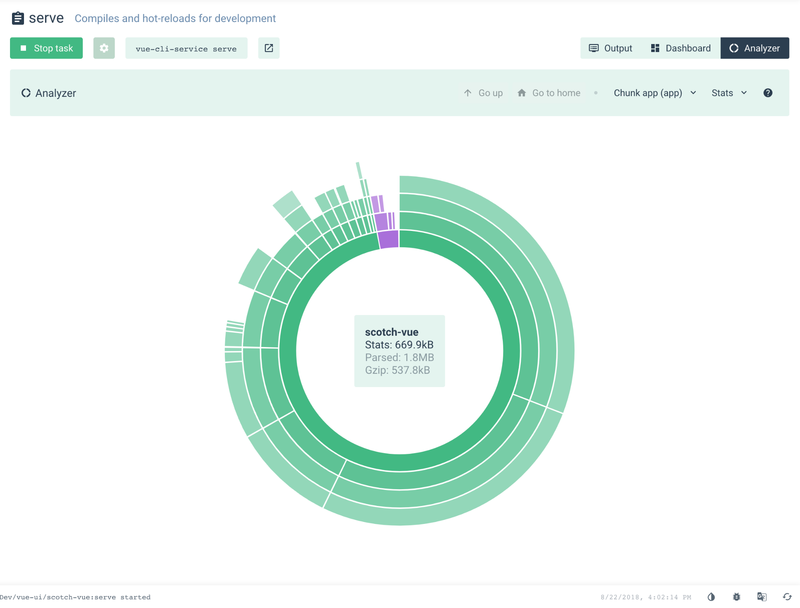 The analyzer tab, tries to analyze your code, and create a graph showing the various dependencies of your code. 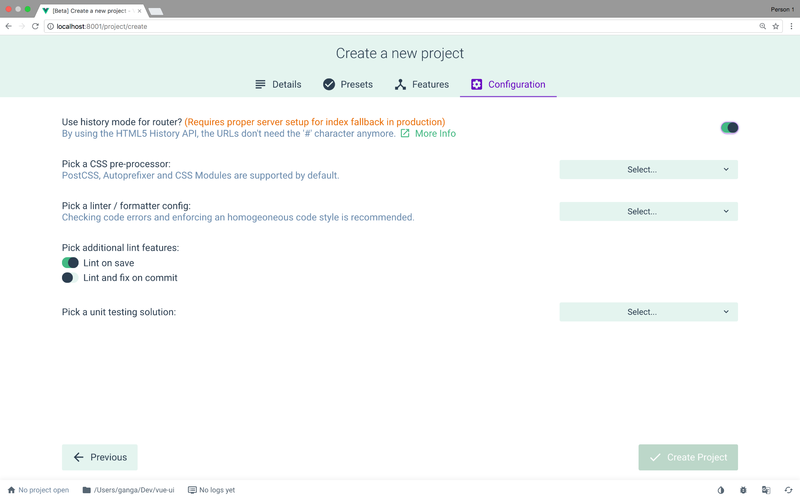 In the below screenshot, we see the purple part representing the code we have written(even though it’s generated), and the green section represents the code that we imported from dependencies. 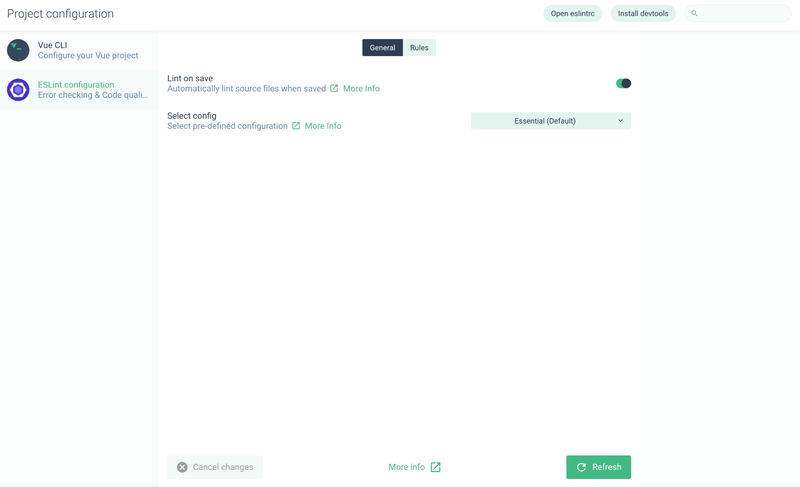 The build section has the almost similar to the serve section, only that it produces a production bundle that can be used to deploy the application. 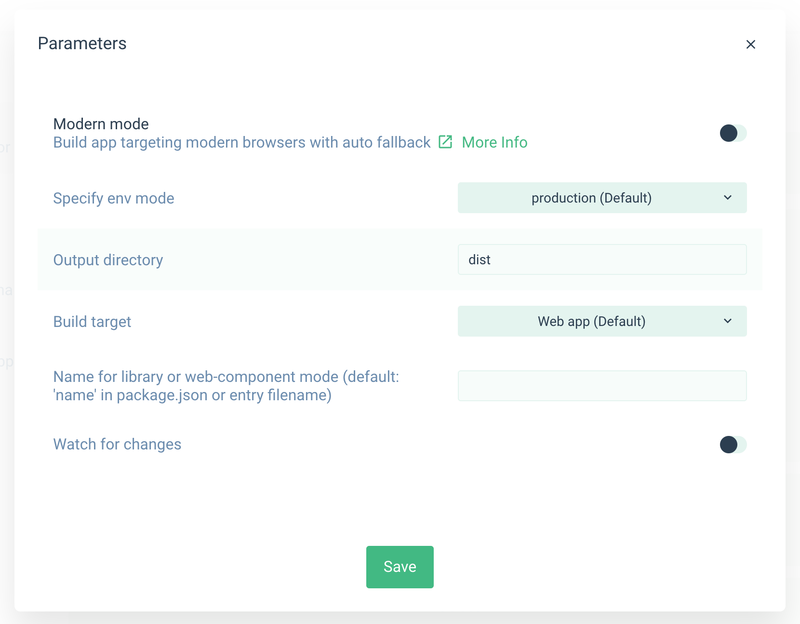 Clicking on the config for build task will also open configuration to allow you specify environments, output directories and even choose whether it’s a web app, library or web component. We won’t look at the different tabs, as we explained them in the previous section, but notice that the analyzer, under your chunked app, has changed. Lint should be straight forward. It will lint your code and give you an output. 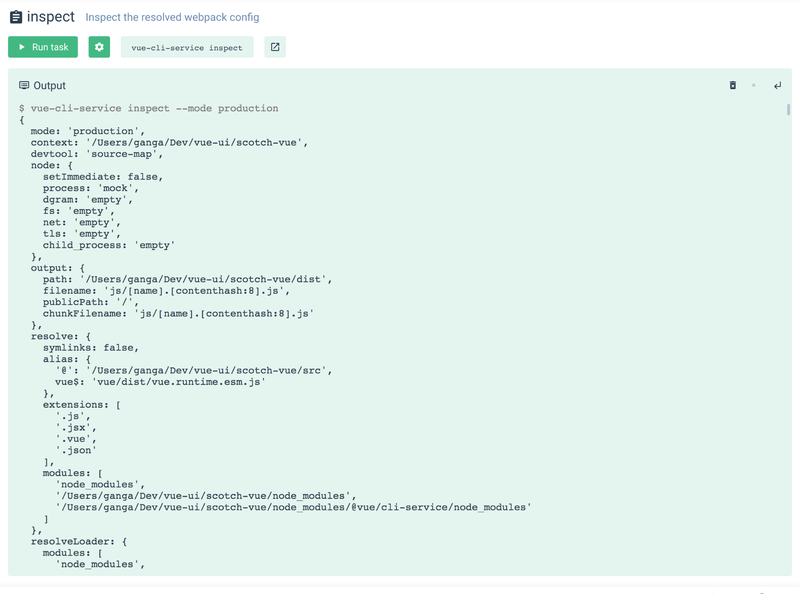 This will produce the configuration of your webpack, in a json file. 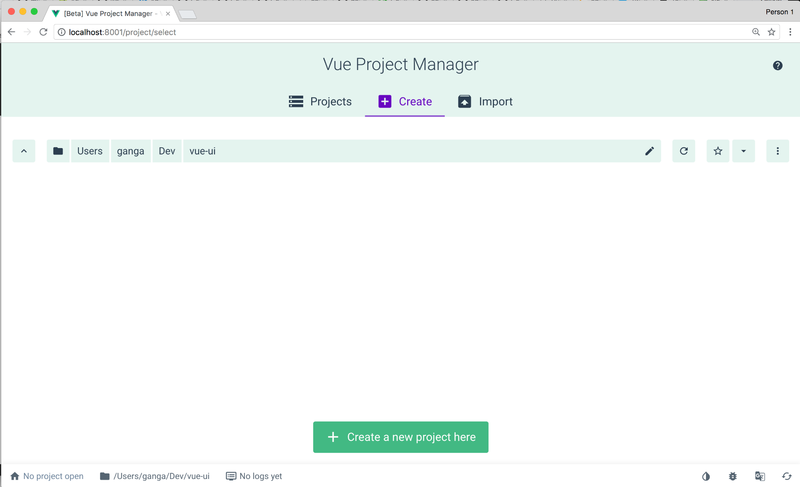 We’ve seen how easy it is to scaffold a new VueJS application from scratch with the Vue UI tool. Even though still in beta, it can take you from Zero to building an App within seconds or minutes. Hope you find the tool helpful and use it more often, and watch out for new releases. If you feel adventurous, you can inspect the Vue CLI UI source code.